After a short stint with The Hour Glass, he was hired by FAME Studios in Muscle Shoals, Alabama, to play on an album with Wilson Pickett’s Hey Jude, 1968 album. Duane’s work on that album got him hired as a full-time session musician, and he was successively featured on releases by artists including Clarence Carter, King Curtis, Aretha Franklin, Otis Rush, Percy Sledge, Johnny Jenkins, Boz Scaggs, Delaney & Bonnie and jazz flautist Herbie Mann. He was noted for his mastery of the slide guitar as well as intensity and soulfulness on “standard” lead and rhythm guitar. They went on to become one of the most influential rock groups of the 1970s. In the meantime, Duane also did some work with Eric Clapton’s Derek and the Dominos and still worked occasionally as a session musician. Their Double live album, At Fillmore East was to become their major breakthrough. Released in 1971, it sold steadily and earned The Allman Brothers Band their first gold record on 25th of October. 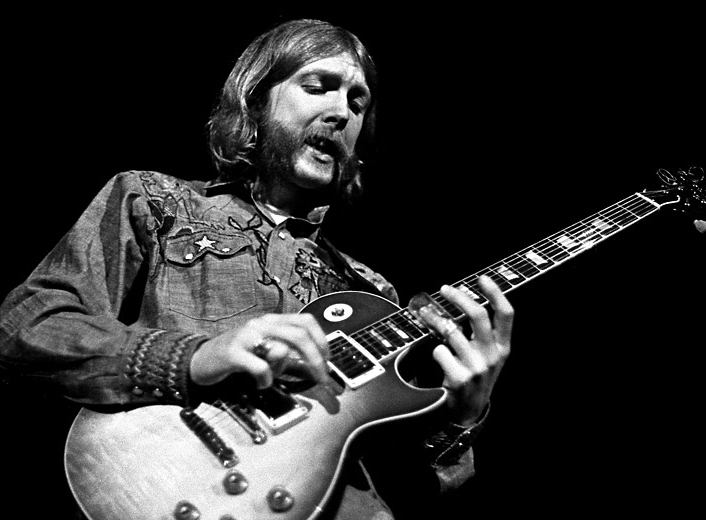 Only four days later disaster struck when Duane Allman got into fatal motorcycle accident. He lost control of his Harley Sportster while trying to swing left, striking the back of the truck or its crane ball. October 29, 1971 at age 24.